Today I was in a very laid back mood, and just wanted to wear something simple. Almost no accessories, and just something comfortable. What better colors to wear on a day like this than grey and white? Hope everyone is having a lovely start to their week! Countdown to my spring break next week starts now. Perfect, as per usual :). Love the red sunnies!! We've got SNOW here in Vancouver, and to think Spring is just a week away! AHH!! Trade links?... I love your blog and style, ps: you're already on my Blog Roll. Love the sunglasses, and the look... flawless!!! 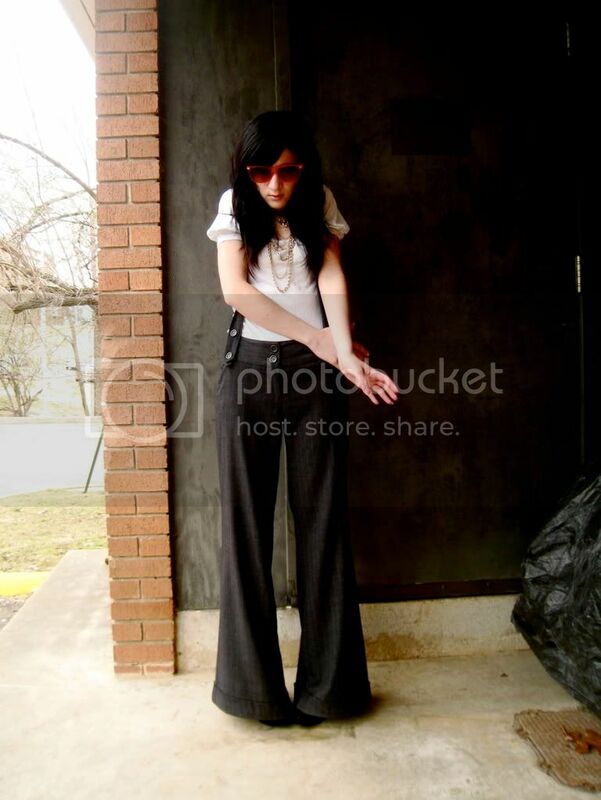 Adore the pants, they make your legs look deliciously long. lovely as always, those pants look stunning on you. 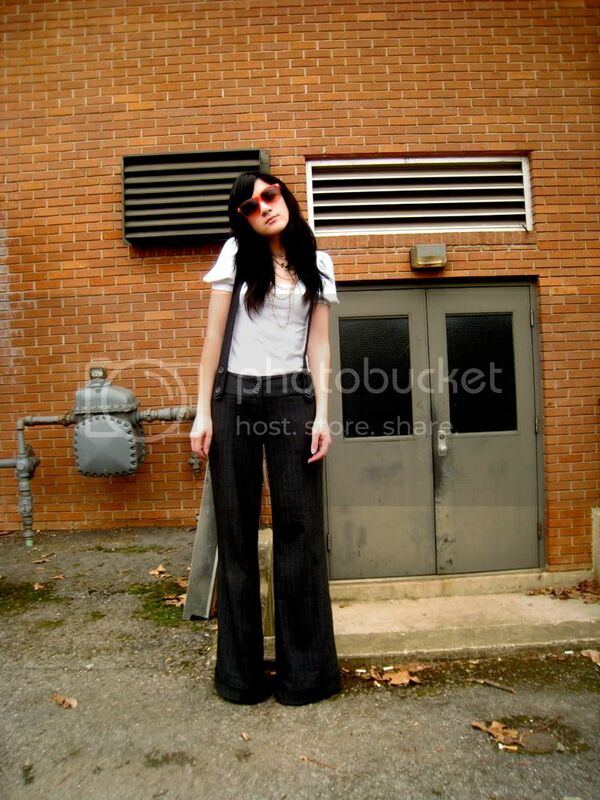 I'm too short for wide leg trousers. lucky lady! Wow, love this outfit!! Those pants are gorgeous and the red glasses just add a great little pop of colour!! simplicity is best, indeed. loving the 70s vibe in this outfit, makes me want to dig up my wide-leg sailor pants. I'm seriously loving your style girl, want to trade links? thank you for the comment in my blog! i appreciate it. oh wow, your outfit is stunning! i like how you match a white top to the wide legged pants! The white tee never never never fails. I love the red to make the outfit! You look great with these sunglasses! And this outfit is really nice, chic! i think these pants look great on you! :)) greetings! Thank you very much ! That's very nice of you ! I'm really happy to hear it (well,to read it !)! By the way I love your pants ! Would you liketo exchange links ? Great trousers. Because I'm so short I can never wear trousers like these as I just look ridiculous. you look awesome love the photo scene too :) the thrifted sunnies are super cute! yes love to exchange links ill add you now ! cool blog!! i will follow! Clean and stylish, looking adorable, dear. oh wow. those pants looks very, very, very hot and chic on you. OOh I really like this outfit, even if it's just a laid back outfit. (Mine, sadly, is still sweatpants and sweatshirt related). and i love how that shirt is simple, but the sleeves add just a touch of something else. you look darling in those pants! suspenders are always fun sugar!you look so chic. This feels modern Katherine Hepburn-esque. Love it! I love the sunnies and the necklaces. This is totally simple, but not at all boring. I need to master that. When I try for simple, I usually go too far. Cute! Suspenders!!! You keep pulling out amazingly inspired outfit after outfit. I can't wait to see what you put on next. I love this, especially the width of the pants! amazing trousers! love the sunglasses too, cute! The sunglasses are awesome and you look fabulous in those pants!! amaaaaazing pants!!!! wide leg always look better on everyone.